Answer. (b) a cloudy day. Question 2. Which of the following is not an example of a bio-mass energy source? Question 3. Most of the sources of energy we use represent stored solar energy. Which of the following is not ultimately derived from the Sun’s energy? Question 4. Compare and contrast fossil fuels and the Sun as direct sources of energy. 4. Fossil fuels can be used for our energy requirement anytime The energy from the Sun can be derived during day time only. Question 5. Compare and contrast bio-mass and hydro electricity as sources of energy. 1. Biomass is a renewable and conventional source of energy. 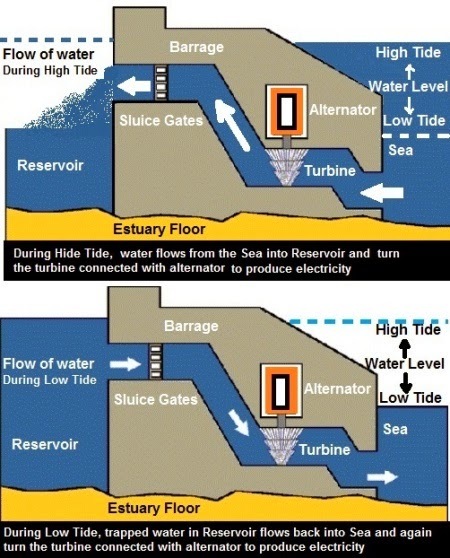 Hydroelectricity is also a renewable and conventional source of energy. 4. Use of biomass does not cause ecological imbalance. Construction of hydle projects for hydro electricity causes ecological imbalances. 5. Biomass is relatively more economic source of energy than hydro electricity. Hydro Electricity is relatively costly source of energy. (a) the wind? (b) waves? (c) tides? Nature , pattern and occurrence of waves is not same for different sea shore locations over time. Are the options given in (a) and (b) the same? Answer. (a) Renewable and non-renewable : Renewable energy sources are those energy sources, which can be restored back to their original form after harnessing energy for various purpose, e.g. Hydro Electricity. Non-renewable energy sources are those energy sources, which can not be restored back to their original form or simply replenished after making use of them for energy requirement, e.g. Coal, Gas, Petrol etc. (b) Exhaustible and inexhaustible : Sources of energy, that will exhaust in near future, are called exhaustible source e.g. Gas, Petrol, Coal etc. Sources of energy, that will not end considerably over very long period of time are called inexhaustible sources, e.g. Sun, Water, Air etc. Question 8. What are the qualities of an ideal source of energy? Question 9. 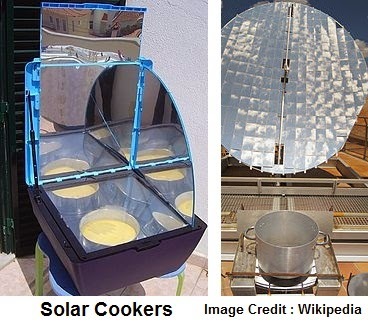 What are the advantages and disadvantages of using a solar cooker? Are there places where solar cookers would have limited utility? It is cost effective and economical to use as there is no recurring cost. It is quite user friendly and easy to handle. The availability and Intensity of Solar energy is not same for all the time at all the places. Yes, there are places where solar cookers would have limited utility. For example, in polar region, there is no Sun shine for almost half of the year. So solar cookers would have limited utility. In hilly areas, shady places under foothills receives very less Sun shine. For others hilly areas, Sun shine may be available for shorter period of time. The intensity of Sun light is very less on Hilly slopes as they receive inclined sun rays. So in such places solar cookers would have limited utility. Question 10. What are the environmental consequences of the increasing demand for energy? What steps would you suggest to reduce energy consumption? The available reserves of energy resources are limited. To meet the increasing demand for energy, these reserves are being depleted very fast, which may lead to theirs scarcity or energy crisis in near future. The use of alternative or non-conventional sources of energy such as Solar energy, wind energy, hydro energy, Tidal energy, wave energy and Ocean Thermal Energy should be optimised to supplement the demand for energy from non-renewable source of energy. Our energy requirements increase with our standard of living. In order to fulfill our energy requirements, we try to improve the efficiency of energy usage and also try and exploit new sources of energy. We also need to look for new sources of energy because the conventional sources of energy like fossil fuels are in danger of getting exhausted soon. The energy source we select would depend on factors like the ease and cost of extracting energy from the source, the efficiency of the technology available for using that source of energy and the environmental impact of using that source. Many of the sources ultimately derive their energy from the Sun.